NASA's Aqua Satellite captured this image of Christmas Island in the Pacific Ocean from space on Nov. 11, 2014. A NASA satellite has snapped a picture of Christmas from space, Christmas Island, that is. The space agency's Aqua satellite, responsible for monitoring Earth's water in its many forms, caught sight of the Kiritimati Island (sometimes called Christmas Island) in the Pacific Ocean, capturing this colorful photo on Nov. 11. Despite its festive Christmas holiday name, Christmas Island, is relatively tiny at 150 square miles (388 square kilometers) in area, according to NASA. The island is part of the Republic of Kiribati. "It [Christmas Island] is located about 141 miles (232 km) north of the Equator and 4,160 miles (6,700 km) from Sydney, Australia," NASA officials said in a statement. "In the Kiribati language, the name 'Kiritimati' is a spelling of the English word 'Christmas.'" The Christmas Island image isn't NASA's only way to get into the holiday spirit. Earthlings can send special season's greetings to astronauts on the International Space Station via Twitter through NASA's website. NASA's Barry "Butch" Wilmore and Terry Virts are both currently living and working on the space station through the holiday season and into 2015. Virts and Wilmore also sent their holiday hellos down to everyone still on the planet in a special holiday video. "It's such an honor, and it's so much fun to celebrate Christmas up here," Virts said in the video featured by NASA. "This is definitely going to be a Christmas that we'll remember, getting a chance to the beautiful Earth. And I hope that for you, also, it'll be a memorable Christmas this year. Have fun with your family, enjoy the day, and merry Christmas." The European Space Agency (ESA) is also bringing space down to Earth for the holidays. Anyone with an Internet connection can send a space-themed holiday e-card to loved ones around the planet. ESA has a variety of holiday card options from stockings hanging aboard the space station to nebulas, the Rosetta mission's comet and an amazing image of Earth taken from space. Editor's Note: This story was updated to reflect a correction on Dec. 24 at 9:30 a.m. EST (0230 GMT). 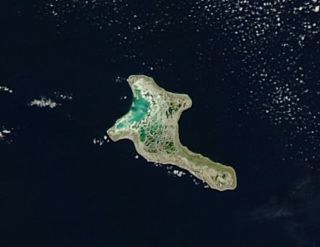 An earlier news release from NASA incorrectly identified the island seen by the Aqua satellite as Christmas Island in the Southern Indian Ocean. The island is actually Kiritimati (also called "Christmas Island") in the Pacific Ocean.